If you enjoy slots with impressive graphics that give you the chance to win huge payouts then you are in for a treat. The last few days have seen some amazing games released with impressive 3D graphics and incredible features. Take a look at our reviews of them below. There are a number of online slots that are themed around the ancient civilisation of the Aztecs and now Random Logic have release their take on the theme. It is a feature packed slot and it even gives you the chance to win a progressive jackpot! When you start playing you will see a short introductory video in which you meet an Aztec man who throws his spear at the game. It is a 5 reel slot with 3 rows and 15 fixed paylines. The reels are transparent and behind them, you can see mountains, rain forests and a large temple. To the left of the reels is an Aztec man complete with spear while to the right you can see the progressive jackpot counter. Occasionally the weather will change in the background and rain will start to fall, you will also see leaves drifting off the trees and the occasional bird. There are five high value symbols, different Aztec masks coloured red, grey, purple, blue and green. The lower value symbols are the playing cards 10, J, Q, K and A. The wild symbol is another mask, golden in colour, and it will substitute for all of the other symbols, except the bonus and scatter symbols, to help and form winning combinations. The scatter symbol is ‘Free Spins’ and the bonus symbol is an Aztec shield. If you can land at least three ‘Free Spins’ symbols anywhere on the reels you will win a random number of free spins, the more scatters there are the more spins you will win. During the free spins the Aztec man will throw his spear at the reels to create wild symbols that remain in place for a number of spins, and occasionally swap positions. If you land the bonus symbol on reels two, three and four simultaneously the bonus game begins. It is a picking game with two rounds and in each round you can win multipliers that are applied to your total bet. The slot’s progressive jackpot is won entirely at random, regardless of which symbols land on the reels. However, the more you bet per spin the better your chances are of winning it. 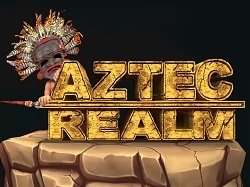 Aztec Realm has a betting range of £0.15 up to £450 per spin so you can play on a smaller budget. The red mask offers the top payout of 1,500x, the grey mask can payout up to 800x, the purple mask can payout up to 400x, the blue mask can payout up to 300x and the green mask can payout up to 100x. This is a fantastic looking slot that offers the chance to win a great deal of money. Give it a spin today and see if you can be the first winner of its progressive jackpot. If you enjoy a day out at the shops with your friends looking round the sales and finding a new outfit, but you are lacking the funds, then perhaps you could win enough for a splurge playing the new Shopping Frenzy slots from Random Logic. Shopping Frenzy is a 5 reel slot with 3 rows and 20 fixed paylines. The reels are set inside a shopping centre with women going up and down escalators on each side and a number of bags on the floor. All of the slot’s symbols are related to the theme, the five high value symbols are five different women, with red hair, blonde hair, black hair, purple hair, and brown hair. The lower value symbols are a shoe, makeup, sunglasses and a handbag. The stack of credit cards is the wild symbol, it will substitute for all of the other symbols, except for the scatter symbol, to help and form winning combinations. The scatter symbol is a collection of shopping bags. The slot’s main bonus feature is a free spins round. If you land three, four or five scatter symbols anywhere on the reels then you will win 10, 15 or 30 free spins respectively. During the free spins all your payouts are tripled. Better still, there is a special mirror feature. The mirror can reflect the symbol to its left and expand to fill all positions on a reel if it will form a win. This results in matching symbols making it far easier to land winning combinations, especially if there is more than one mirror on the reels. Shopping Frenzy has a betting range of £0.20 up to £500 per spin so you can enjoy it whether you are a low or high roller. The woman with red hair offers the top payout of 500x, the women with blonde and black hair can both payout up to 250x, while the women with purple and brown hair can both payout up to 100x. The shoe and makeup can both payout up to 75x and the sunglasses and handbag can both payout up to 25x. While this slot may be packed full of stereotypes about women and shopping, it is still a great looking game with an excellent free spins round. Give it a spin today and you may soon be on the shopping trip of a lifetime. 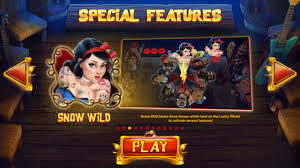 We all know the story of Snow White, but Red Tiger Gaming have reimagined the classic tale with Snow White as a wild party girl who gets in to all kinds of trouble and along the way helps you towards great winnings. Snow Wild and the 7 Features is a 5 reel slot with 3 rows and 20 fixed paylines. The reels are set on top of a table in a room full of guitars and speakers, and a rock soundtrack accompanies the game. The high value symbols are a bag of diamonds, a mug of beer, and a chewed apple. The lower value symbols are the playing cards 10, J, Q, K and A. The wild symbol is the mirror with Snow Wild’s face in it, it will substitute for all of the other symbols, except for the bonus symbol, to help and form winning combinations. The bonus symbol is a Lucky Wheel. Boozy – If the wheel lands on Boozy he will open the beer taps and turn at least one reel wild. Goldy – If the wheel lands on Goldy he will shake a bucket of coins above the reels and award an instant cash prize. Dozy – If the wheel lands on Dozy he will snore and blow symbols around the reels to form wins. Sneaky – If the wheel lands on Sneaky he will get out a saw and chop up the reels, he then replaces the reels to create new winning combinations. Tickly – If the wheel lands on Tickly he will sneeze and award at least one free re-spin. Flash – If the wheel lands on Flash then lightning will strike the reels to replace the symbols and hopefully form a big win. Crazy – If the wheel lands on Crazy he will drag symbols off the reels and replace them to create a guaranteed win. Snow Wild and the 7 Features has a betting range of £0.20 up to £40 per spin so it is perfect for all sizes of budget. The wild symbol offers the top payout of 500x, the diamonds can payout up to 300x, the beer up to 180x and the apple up to 120x. Why not join Snow Wild and her crazy friends today. Go to their party and with a bit of luck you will be coming home with some huge winnings. These are just three of the slots that have been released in recent days and there are many more exciting games in the pipeline. Be sure to check back regularly to make sure that you aren’t missing out on any of the latest action.